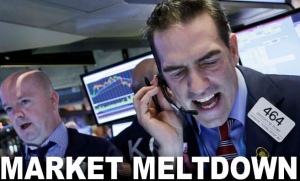 Rising interest rates, a trade war, and possibly one of the largest bubbles in stock market has just caused a trillion dollars in wealth to vanish. Considering that 90 percent of the savings of Americans who have any money is invested in the markets, the economy may begin to show some pain. We know from history, that bubbles in the market to pop, but how long it takes for the markets to come back is the question. Whether the stock market sell of will cause a recession, or whether we are already in a recession time will tell. But one thing is for sure, there are forces swirling around the financial system that could cause a catastrophic financial event at any moment. Consider that recently it was announced that the Chinese Intelligence Agency has has been putting chips in computer routers. The data that may have been extracted and how it was used is unknown right now. But if you just imagine what could come of this, it could be worse than any financial event ever experienced. Trade War with China? What is all they had to do was use their backdoor chips to turn off the Wall Street trading system? Or what about a power grid shut down. If you use your imagination, there are even worse things that could happen if our enemies really wanted to cause damage to our great democracy.